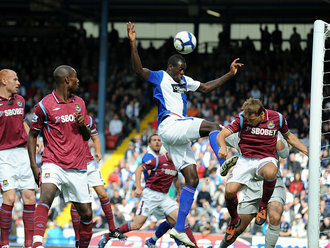 Blackburn teenager Junior Hoilett spurned the best chance of a fairly tedious goalless draw against West Ham at Ewood Park. The 19-year-old substitute's 20-yard chip over Robert Green in a one-on-one with the goalkeeper dropped onto the top of the net in the 77th minute. Prior to that Carlton Cole had the visitors' best effort, curling wide a 20th-minute shot from a narrow angle while Rovers defender Chris Samba fired over from the edge of the penalty area in the first half. Hoilett's 30-minute cameo was one of the few positives on a frustrating afternoon for Blackburn. The other was securing their first point of the season - after defeats to Manchester City and Sunderland - which meant they avoided equalling their worst start to a season since 1947/48. West Ham were not much better, with Cole - starved of service and support - having little chance of showing the form of an England international. The game began brightly with debutant Pascal Chimbonda's surging run down the left touchline resulting in James Collins, on his 100th league start, being booked for a foul on Morten Gamst Pedersen. David Dunn, on his first league appearance since April, lofted over the ninth-minute free-kick which Chris Samba headed back across goal but the stretching Jason Roberts could not divert the ball in. Samba was then involved at the other end as some neat interplay between Junior Stanislas and Luis Jimenez set up Cole only for his shot to be blocked by the big Rovers defender. The England striker was being kept on a tight rein by the centre-back but when he burst into the left of the penalty Samba slipped to leave Cole clear. He had a narrow angle from which to shoot but curled his right-footed effort wide of the far post without drawing Paul Robinson into a save. Chimbonda twice denied Jimenez with sliding blocks in the penalty area before Samba, who seemed to be the major player at both ends of the field, fired over from the edge of the West Ham box after the visitors had failed to clear Roberts' pull-back. Three minutes into the second half Cole lashed a 20-yard shot over Robinson's crossbar with Collins' shot from Mark Noble's left-wing corner also too high. Roberts was becoming increasingly isolated up front and in an attempt to counter that manager Sam Allardyce replaced holding midfielder Steven Nzonzi with Hoilett. Andrews dropped back to allow the 19-year-old Canadian to occupy the wide right slot in midfield. Gianfranco Zola's change was to replace Jimenez with Kieron Dyer, making only his 10th appearance for the Hammers since August 2007. Hoilett's first involvement was to shoot into the side-netting from Dunn's reverse pass in the 68th minute before returning the favour only for the midfielder to shoot straight at Green from 25 yards. Summer signing Nikola Kalinic replaced Roberts for his home debut with 16 minutes remaining. But it was Hoilett who should have broken the deadlock in the 77th minute when Dunn picked him out on a swift counter-attack with an incisive outside-of-the-foot pass. Green raced out to meet the youngster who tried an audacious 20-yard chip which landed on the roof of the net. It was the closest either side came to scoring on a disappointing afternoon. Blackburn Robinson, Jacobsen, Samba, Givet, Chimbonda, Grella,Nzonzi (Hoilett 60), Andrews, Dunn, Pedersen,Roberts (Kalinic 75). Subs Not Used: Brown, Emerton, Khizanishvili, Olsson, Salgado. West Ham Green, Faubert, Collins, Upson, Spector,Jimenez (Dyer 66), Parker, Noble, Collison (Kovac 87), Cole,Stanislas. Subs Not Used: Kurucz, Gabbidon, Nouble, Tomkins, Hines.